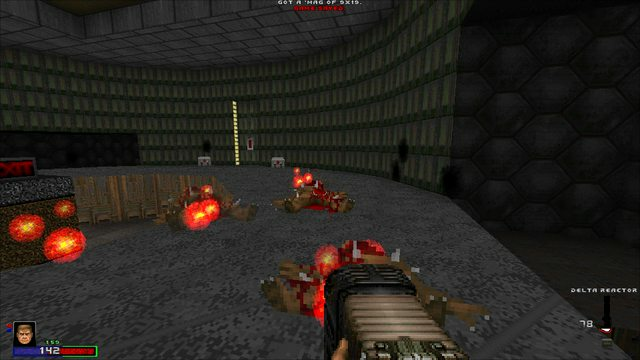 Hell Caliber is a weapons+monsters gameplay mod for Doom/Doom 2 and GZDoom. It can be considered an overhaul, as it adds more features to the original content without completely changing it. With this mod, Doom still remains Doom, but with additional details and surprises. 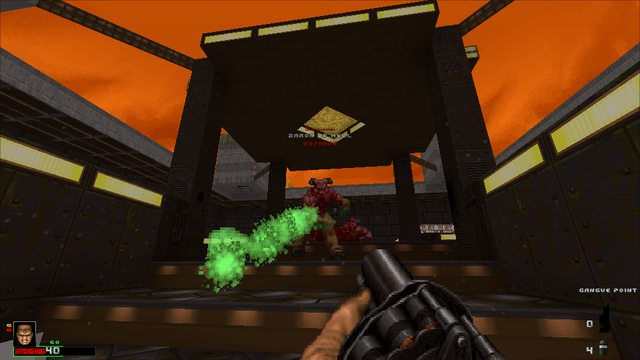 The arsenal follows the standard formula: starting weapons are fists and pistol, then you get your hands on an additional melee weapon, two shotguns, a machinegun, an explosives launcher, a plasma rifle, and, of course, on a Big Fun Gun. Most of the weapons require reloading. Note that there is an option for automatic reloading when you dryfire, but this option is disabled for the hardest difficulty. All the weapons feature extensive recoil, which can be configured or turned off entirely if you so desire. Fists (HamHands). There are two of them: left and right. You can swing two fists faster than one if your timing is good. As usual, fists become much more powerful after you stumble upon a Berserk pack. Pistol (Future Beretta). Fires almost as quickly as you pull the trigger. The faster you shoot, the worse is accuracy. To compensate increased rate of fire, Beretta requires reloading and holds up to 16 bullets. Shotgun (UASG-12). Workhorse gun, reliable and effective. Requires reloading, having up to 8 shells loaded. Super Shotgun. Double-barreled beast of a gun. What else to say? Machinegun (FFS-9x19). Rapid-fire bullet deliverer. Best fired in short bursts, otherwise, accuracy quickly degrades. Requires reloading, holds up to 51 bullets. Bumper Grenade Launcher. 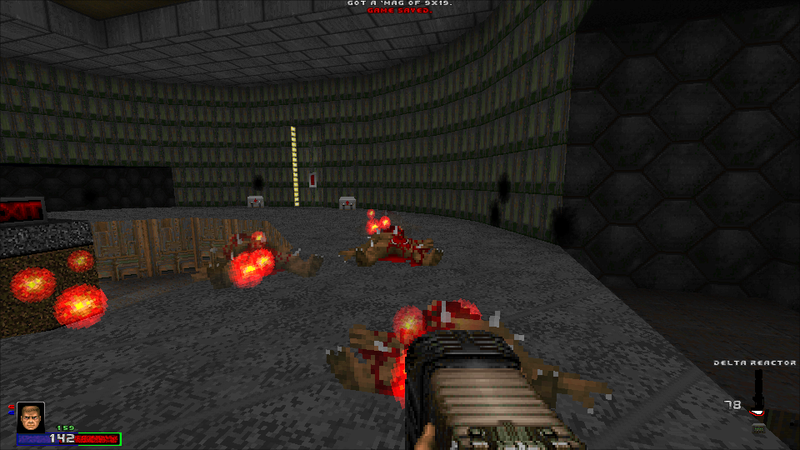 Unlike other similar weapons, this specimen provides a safety feature: launched grenades don’t explode if they land too close to the weapon user. Therefore, it’s much harder to blow yourself up instead of the enemy. Grenades also bounce off walls. The ones that didn’t explode on impact can be shot later, what will cause them to explode. Great tactical weapon. Requires reloading, holds up to 5 grenades. Plasma Rifle (prototype). 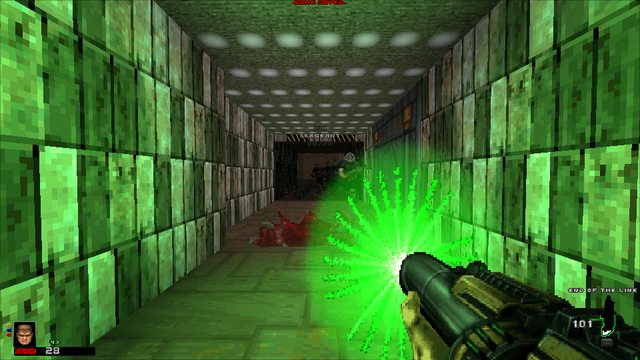 Works similarly to original Doom Plasma Rifle, except that this one can overheat after long usage. Just let it have a rest from time to time. 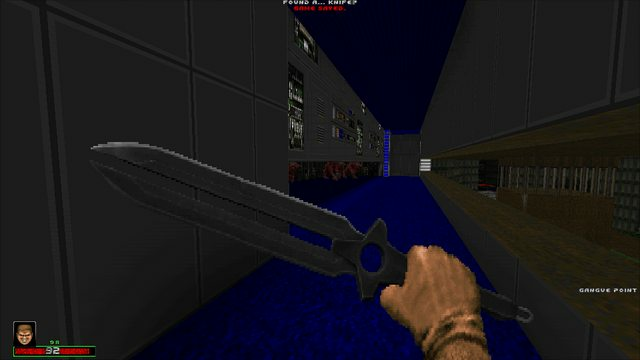 BFG-SG. May or may not be a Russian invention. This thing allows controlling the shot power. Charge it to the desired power level, and release that charge in the general direction of your enemy. Should do the trick. Sword (or, more precisely, “Sord”). It’s a fast melee weapon that can also do a curious move. It can be charged with a portion of your health to unleash the powerful attack. Legends say that the sword is also affected by Berserk pack. Monsters learned some new tricks. Their movements became less predictable. In general, monster types now differ more from each other, like they have their own personalities. A lot of work is done on projectiles and explosions. Shotgunners and chaingunners now drop helmets sometimes, giving you a small armor bonus. Imps can hide (cloak) on hit, reappearing in another place. Also, imps don’t leave corpses, they burn instead. Demons became far more dangerous and aggressive. Spectres became more stealthy, being completely invisible until they attack you. 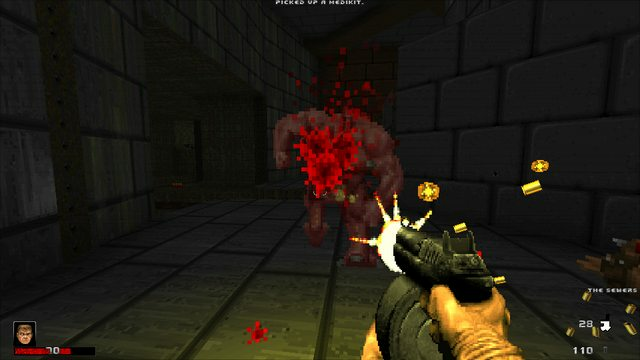 Cacodemons’ projectiles are harder to dodge now. Lost Souls follow you around, and instead of attacking you, they explode, damaging everything. For the balance, they are vulnerable and die (exploding) from the single shotgun hit. 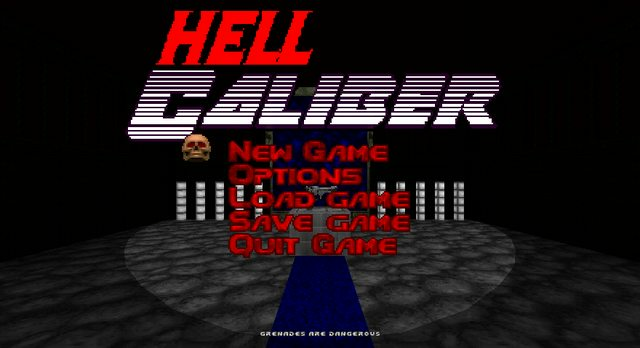 Hell Caliber features meaner version of Hell Knights and Barons of Hell. They throw two projectiles instead of one, and Barons sometimes throw a wave of projectiles that is very hard to dodge. 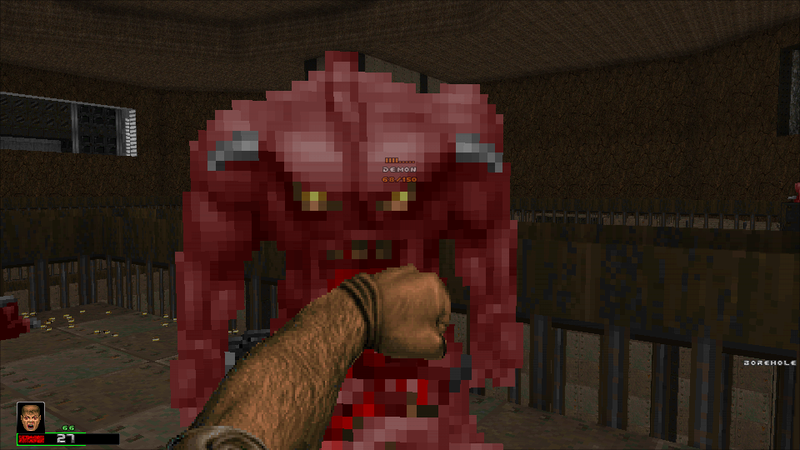 There is a new monster, Cybruiser, from which you better run. It replaces an Archvile, and this is a big plus for Archvile-non-likers. Revenants always fire two homing projectiles, but with a twist: they are destructible. So aim and shoot them down before they reach you! Or hide, if you are more on the coward side. Cyberdemon and Spider Mastermind received an additional attack each and became more weighty and dangerous. Other things that I’d like to mention are HUD and Tips. HUD is minimalistic and efficient. It displays health and armor in neat bars on the left side of the screen, so you can always see how well you are doing with a quick glance. On the right side, is weapon status, that contains ammo counts (with a bar too), and charge/overheat indicators. Tips are just text strings that appear when you start the level. It sounds simple, but they provide helpful information on mod mechanics or amusing commentaries on the game. then yes. Otherwise, probably yes too, because you may start liking these things after Hell Caliber.